This is a list of radars. A radar is an electronic system used to detect, range (determine the distance of), and map various types of targets. Jindalee - Over the horizon radar, air and sea search radar. CEAFAR CEA Technologies a 4th generation multifunction digital active phased array radar. DARS Deployable Air operations centre, Recognized air picture production centre, Sensor Fusion Post. A new state of the art mobile deployable NATO Command & Control radarsystem controlling and safeguarding the operational airspace anywhere in the world. S1850M - long range radar, advanced derivative of SMART-L.
SAMPSON - multi-function radar for the Type 45 destroyers. HEMPAS-CCIAS Radar Long Range Tracking Radar capable of detecting stealth aircraft. Super Vision-2000 3D airborne naval surveillance radar. INDRA series of 2D radars, low level radar to search and track low flying cruise missiles, helicopters and aircraft for the Indian Army This is a phased array radar with swift multiple beam tracking of targets and the Indian Air Force. Central Acquisition Radar (3D-CAR) planar array tracking radar for all branches of the Indian armed forces. Air force version known as the Rohini. Naval version known as Revathi. 3D AESA Long Range Tracking Radar tracking high speed ballistic missile targets. Low Level Lightweight Radar(LLLR) 2D low level aircraft tracking radar. Weapon Locating Radar 3D passive electronically scanned array to detect multiple targets for fire correction and weapon location developed from Rajendra. HAL Multi-mode radar 3D advanced, lightweight multimode fire control radar for LCA Tejas. Short Range Radar 3D tracking small fighter sized targets. BFSR-MR 2D medium range battlefield surveillance for the army. Probably has been replaced by long range battlefield surveillance radar. MFCR 3D active phased array radar, complements the Long Range Tracking Radar, for intercepting Ballistic Missiles. MEDIUM POWER RADAR 3D ACTIVE PHASED ARRAY RADAR, being developed for the Indian Air Force for ranges exceeding 300 km. "Head Net A" 2D air surveillance and surface search. Sometimes used i combination with Top Steer. P-3 "Dumbo", Early warning ground control radar. P-8 "Knife Rest A", Early warning ground control radar. P-10 "Knife Rest B", Early warning ground control radar. P-12 "Spoon Rest", Early warning ground control radar. P-14 "Tall King", Early warning radar. P-15 "Flat Face A", Surveillance/Target acquisition radar. P-18 "Spoon Rest D", Early warning radar. P-19 "Flate Face B", Surveillance/Target acquisition radar. P-20 "Bar Lock", Early warning ground control radar. P-30 "Big Mesh", Early warning ground control radar. P-35 "Bar Lock", Early warning ground control radar. P-40 "Long Track", Early warning/Target acquisition radar. Kasta 2E "Flat Face E" Surveillance radars. Radar, AA, No. 2, Marks I through VII were a 1.5 metre wavelength Searchlight Control (SLC) radar known as 'Elsie'. The only difference between these Marks was the mounting arrangement. Marks VIII and IX were centimetric versions that did not see service. Radar, AA, No 3, Mk 2 (F) - Anti-aircraft fire control modified for mortar locating. Radar, AA, No 3, Mk 3 - "Emergency" anti-aircraft fire control known as 'Baby Maggie' adapted from SLC. Also used for mortar locating. Radar, AA, No 3, Mk 7 - Post-war anti-aircraft fire control. Radar, AA, No 3, Mk 8 - Designation for US-made SCR-545 radar, but not used in service. Radar, AA, No 4, Mk I - Anti-aircraft local warning, known as 'Zippy'. Radar, AA, No 4, Mk II - Anti-aircraft local warning. Radar, AA, No 4, Mk III - Anti-aircraft local warning. Radar, AA, No 4, Mk V - AMES Type 14 Anti-aircraft local warning, known as 'Gorgonzola'. Radar, AA, No 4, Mk VI - Canadian-made Anti-aircraft local warning. Radar, AA, No 4, Mk VII - Anti-aircraft local warning. Radar, AA, No 5, Mk Ii - AMES Type 11 Anti-aircraft local warning. Radar, FA, No 1, Mk 1 - Control of artillery fire against ground targets. Radar, FA, No 1, Mk 2 - Control of artillery fire against ground targets. Radar, FA, No 2, Mk 1 - Doppler radar used to detect moving ground targets. Radar, FA, No 3, Mk 1 - Mortar locating. Radar, FA, No 3, Mk 2 - Mortar locating derived from AN/APS-3. Radar, FA, No 3, Mk 1- Mortar locating . Radar, FA No 8 - "Green Archer" mortar locating . Radar, FA, No 9 - "Robert" long range ground surveillance mounted in Saracen. Radar, CA, No 1, Mk 4 (F) - Coast artillery fire control modified for use against ground targets. Radar, FCE, No 7 - Fire control equipment with 2 radars in a single trailer for aiming a L1A1 40/70 AA gun. Radar, FA, No 14 - ZB298 short range manportable ground surveillance. Radar, FA, No 15 - Cymbeline mortar locating. Blindfire - Fire control used with Rapier missile system. Dagger - Surveillance used with Rapier missile system. Type 86 - "Indigo Corkscrew" Bristol Bloodhound air defence missile system. Type 901 - Naval fire-control for Sea Slug missile. Type 98 - Long Range Search. Type 93 - Long Range Search. Type 101 - Long Range Search. Type 102 - Long Range Search. AI.24 Foxhunter for the Panavia Tornado Air Defence Variant. 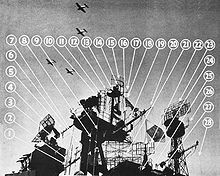 From February 1943 the US used a universal system to identify radar variants, consisting of three letters and a number, respectively designating platform, type of equipment, function, and version. This system was continued after WWII with multiservice designations being prefixed by 'AN/' for Army-Navy. Multi-service classification codes according to the Joint Electronics Type Designation System. AN/BPS-11 Surface search radar, for submarines. AN/BPS-15 Surface search radar, for submarines. AN/BPS-16 Surface search radar, for submarines. AN/SPG-49 Illumination and tracking radar associated with RIM-8 Talos fire control system. AN/SPG-55 Illumination and tracking radar for Terrier Guided Missile Fire Control System. AN/SPG-59 Multifunction radar for Typhon combat system. Canceled 1963. AN/SPG-60 Illumination and tracking radar. AN/SPG-62 Illumination radar for Aegis combat system. AN/SPS-2 Long range height finding radar by General Electric. AN/SPS-3 Also known as XDK, 3D target designator/rapid volume search radar jointly developed by MIT Radiation Laboratory and Naval Research Laboratory. AN/SPS-4 Surface and low altitude air search radar by Raytheon. AN/SPS-32 Part of SCANFAR system. AN/SPS-33 Part of SCANFAR system. AN/SPS-41 Navigational radar for small boats. AN/SPS-46 Navigational radar for small boats by Lavoie Laboratories. AN/SPS-53 Navigational radar by Sperry Corporation. AN/SPS-54 Surface search radar by Sperry Corp.
AN/APS-57 Small boats navigational radar by Ridge Electronics. AN/SPS-59 Military designation for the LN-66 short-range navigation radar manufactured by Marconi of Canada. In service in many US Navy ships as well as in the SH-2F LAMPS I ASW helicopter. AN/SPS-60 Solid state version of AN/APS-53. AN/SPS-61 Teledyne-Ryan’s entrant into the 1967 emergency missile-detection radar program won by Westinghouse’s AN/SPS-58, never went to production. AN/SPS-62 Westinghouse's improvement of AN/SPS-58 with nine examples were ordered in 1973 but quickly cancelled, it appears that Westinghouse simply rolled some of AN/SPS-62's features into AN/SPS-58D. AN/SPS-63 US designation for Italian 3RM-20H surface search radars by Dynell Electronics. AN/SPS-64 Navigation radar, a surface navigation and search radar, made by Raytheon and used both commercially (brand name Mariner's Pathfinder) and by navies worldwide. AN/SPS-65 Development of AN/SPS-58 by Westinghouse as a low altitude radar that is part of the Mark 91 Fire Control System for the Sea Sparrow air defense missiles. AN/SPS-66 Small boat navigational radar by Raytheon. AN/APS-69 Military designation for Raytheon R41X, with a simple slotted-waveguide bar-type antenna, and a 7" colour CRT display. AN/SPS-71 Improved AN/APS-69 with a dielectric dome protector for the antenna and a 10" color CRT control console with more features. AN/SPS-72 Raster-scan collision avoidance radar (RASCAR) by Sperry. AN/SPS-74 Anti-submarine surface radar by Ultra Electronics 3 Phoenix. AN/SPS-75 US designation of TRS-3D radar. AN/SPS-76 Long range 3D air/maritime/surface search/surveillance radar by ITT Excelis. AN/SPS-77 US designation of Sea Giraffe AMB (Agile Multi-Beam) radar. AN/MPQ-35 PAR (Pulse Acquisition Radar) high/medium-altitude threat detection radar for MIM-23 Hawk surface-to-air missile system. AN/APG-4 L band low altitude torpedo release / aiming radar for Grumman TBM Avenger with nickname of Sniffer. AN/APG-6 L band low altitude bombing radar nicknamed Super Sniffer. Improved AN/APG-4. AN/APG-13 General Electric 75 mm nose gun aiming radar for North American B-25H Mitchell. AN/APG-16 improved AN/APG-2 gun aiming radar for B-32. AN/APG-19 X band gun aiming radar by Glenn L. Martin Company improved AN/APG-8 and AN/APG-18. AN/APG-46 original fire control radar of Grumman A-6A Intruder. AN/APQ-183 multi-mode radar for RQ-3A. AN/APS-149 Littoral Surveillance Radar System (LSRS) developed by Raytheon for P-3C to replace earlier AN/APS-135/137. AN/APY-11 US designation for Elta EL/M-2022 maritime, littoral and surveillance radar jointly produced by ITT Exelis to support the United States Coast Guard’s Long Range Surveillance HC-130J aircraft. ^ Aytug Denk (2006). Detection and jamming Low Probability of Intercept (LPI) RADARS (PDF) (Masters). Naval Postgraduate School, Monterey. p. 44. Archived from the original on 2012-04-25. ^ a b c d e f g h i j k "AN/SPS Series Radars". Retrieved 2013-02-13. ^ Cord, A; Keneally, J; Joyce, F (1964). AN/TPS-39 Information Bulletin (PDF). http://308smw.com/files/AN_TPS-39_tipsie_manual.pdf: Sylvania Electronics Systems. ^ Andreas Parsch (2008-11-26). "AN/APN - Equipment Listing". Designation-Systems.Net. Retrieved 2011-02-26. ^ "AN/APN 242 OEM Replacement for AN/APN-59 Radar". Northrop Grumman. Archived from the original on 2011-01-03. Retrieved 2011-02-26. ^ "AN/APN 242 Airborne Radar Color Weather & Navigation Radar". Northrop Grumman. Archived from the original on 2012-09-10. Retrieved 2011-02-26. ^ a b "Navy Moves Forward On Advanced Airborne Radar". Retrieved 2012-06-18. Polmar, Norman (December 1978). "The U.S.Navy: Shipboard Radars". United States Naval Institute Proceedings. Polmar, Norman (July 1981). "The U.S.Navy: Sonars, Part 1". United States Naval Institute Proceedings. Sayer, Brig A.P., Army Radar, London: War Office, 1950. This page was last edited on 15 March 2019, at 22:42 (UTC).